Today I travelled to Katonah for a snipe hunt. Bylane Farm, a sanctuary owned by Bedford Audubon, is a large old farmstead located on a rut-filled dirt road, a peaceful rustic setting. 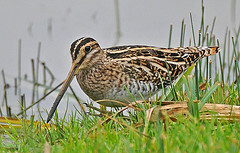 A Wilson Snipe has been a steady visitor at farm’s pond for over a week. A small parking area overlooks a gently sloping valley with the pond at the low point. 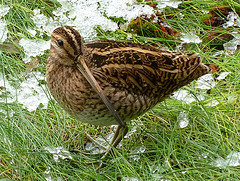 Immediately as we stepped out of the car we could see the snipe feeding with its characteristic “sewing machine” motion not 200 feet away. Excellent view. Hard to miss. In fact, our view was so good we didn’t bother to plod through the snowy field toward the pond for a closer look. Our view was great. “Easiest Life Bird ever” to quote Bill VanWart. Janelle Robbins, Exec. Director of Bedford Audubon, invited us into the farmhouse for even better views as well as conversation and photos of the chickens she is raising at her home in downtown Yorktown. Alan Soiefer did some research in preparation for our snipe hunt. He informed us that when a snipe is suddenly flush from its marshy habitat it flies off in an rapid, erratic zigzag flight. Hunters shooting shorebirds find it almost impossible to track and shoot a snipe. Any hunter who was good at shooting snipe became known as a “sniper”. That is the origin of the term meaning an excellent shot.